Decision: Should you play Great Cunning? Tempo effects like the one on Great Cunning crop up in almost every game that has a turn-based system; the idea being that getting two effects before your opponent can get one is a good thing. Generally, that's true. An example of a good tempo card would be Time Trap - so good, in fact, that it got banned. 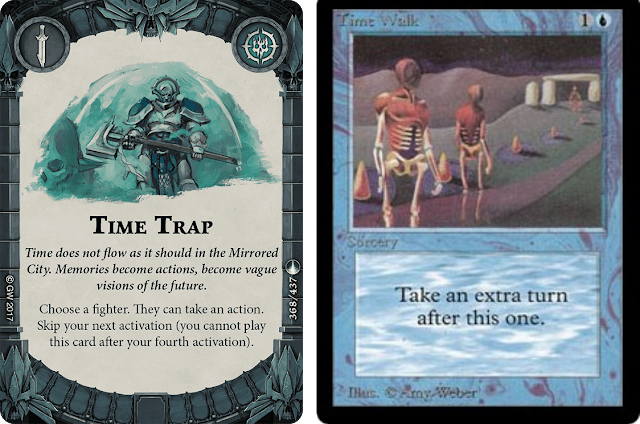 Those of you familiar with that other game are probably aware of what might be the greatest tempo card of all time as well: Time Walk. Great Cunning, on the other hand, is an example of a very bad tempo card. Let's take a look at why. Let's begin with situations in which you can't play Great Cunning at all. The most obvious is when your leader is dead. That's rough, but cards like Quick Advance have the same requirement and are still playable. 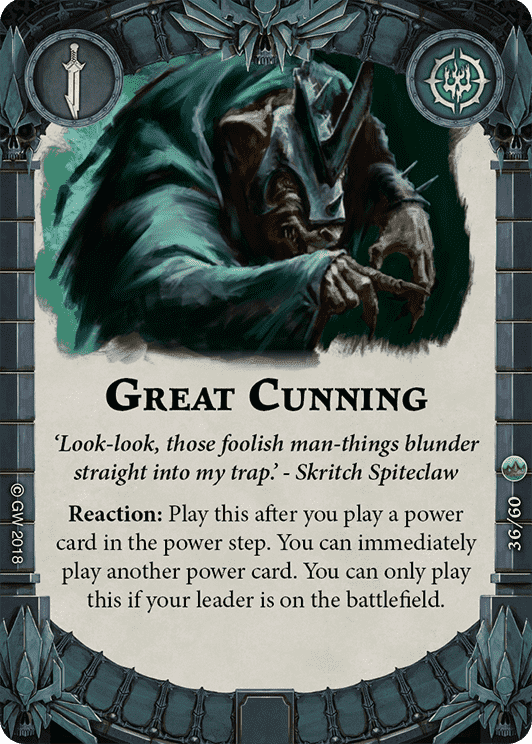 Secondly, you might not have enough power cards - if you've played down to 2 cards and Great Cunning is one of them, you can't make use of it. Additionally, the type of power cards in your hand matters; for example, if you don't have any glory to play upgrades and your hand is stacked with them, Cunning is unplayable. In an average first draw, you'll see 3 upgrades 50% of the time, which means if Cunning is one of your two gambits, it's absolutely dead until you gain a glory or draw another gambit. Finally, Cunning doesn't work with reactions. Of the 245 available gambits at this time, 68 (including many of the most powerful effects) are reactions, which don't interact with Cunning in any way. For a card that only gives tempo advantage, there are a lot of situations in which it simply can't be played. Let's give Great Cunning the benefit of the doubt and say that we're in a situation where it can be played; the real question is why would you? In order for this particular tempo card to be useful, we first must have 2 other power cards that we wish to play in quick succession; for simplicity sake, we'll call them Card A and Card B. In order to derive any benefit at all from Great Cunning, Cards A and B have to meet certain criteria. Card A must have an effect that can be "undone" by an opponent's power card - this is the situation we're trying to prevent by playing Cunning. Some examples of what Card A might do include "1 damage" (undone by healing power cards) or "push 1 hex" (undone by another push card). Card B must have an effect that is dependent on the game state set up by Card A still existing, and it must alter that state in such a way that the effects of Card A and Card B can no longer be undone by an opponent's power card. An example here might be targeting a model with 2 wounds first with Card A (deal 1 damage), then Cunning, then Card B (deal 1 damage). Since the model dies before the opponent can play a power card, you've actually used Great Cunning to accomplish something. Finally, and this one is tricky to quantify, in order for Cunning to be good, your opponent has to have a power card that could actually disrupt your plan in hand (in the example above, Healing Potion would do), and you have to have a pretty good idea that they do. So, short of your opponent dropping their hand on the table, you've got some guesswork to do. If your opponent doesn't have an appropriate power card in hand, you haven't gained anything from Cunning. With some brain-wracking, it's not impossible to come up with situations where you could derive benefit from Great Cunning. If, for example, your opponent's model is standing on an edge hex that is also an objective token and they are down to 2 wounds, you might use Lethal Ward-Great Cunning-Encroaching Shadow to kill them. Congratulations! The problem here (beyond the obvious ones of enemy positioning, health, and you having a 3-card combo in a 1-of deck) is that unless your opponent had a healing power in hand, you could have accomplished the exact same thing without Great Cunning. One other situation that Great Cunning could be used is to lock an opponent out of an objective that they are standing on. You could play Distraction-Great Cunning-Shardfall to push a model off of an objective then block it before your opponent has a chance to push back onto it. The problem here, again, is that if your opponent didn't have a push gambit in hand, you didn't really get any benefit from Great Cunning. Surely, there are a few other edge cases where Great Cunning could be useful. We aren't ruling that out. What we are saying is that those situations in which Great Cunning provides benefit are so rare and so specific that playing it is a bad choice. In a 20 card deck (you aren't playing more than that, are you? Cut to 20, walnut), you'll draw Great Cunning in a quarter of your starting hands. You'll see the types of situations above much less than that, so most of the time it'll be dead in your hand. 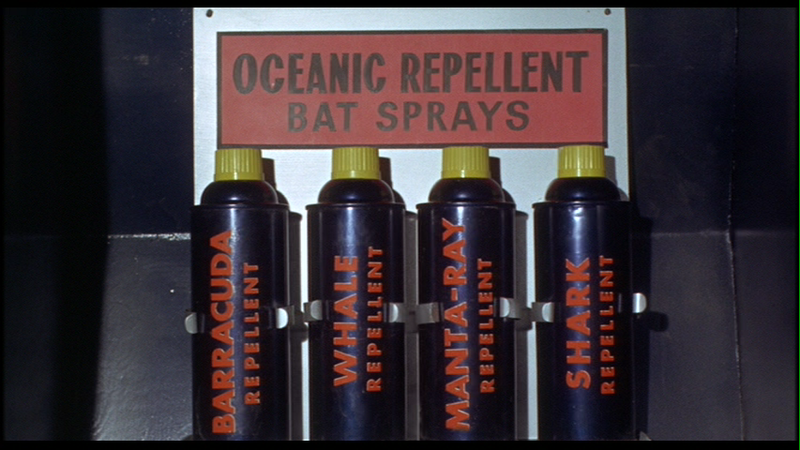 In the 1966 film Batman, Adam West is attacked by a shark stuffed full of explosives while hanging from the ladder of a helicopter. Fortunately, his helicopter is inexplicably stocked with "Oceanic Repellent Bat Sprays," one of which repels sharks. A quick spritz of the convenient Deus ex Machina, and the shark falls into the water before exploding. Great Cunning is shark repellent. You're so unlikely to ever gain benefit from it that it's not worth packing; and if you can come up with a situation where you need it, maybe you should just stay away from the ocean during explosive shark spawning season instead.